libcom: What is the background to the strike action and the concrete demands? N: Governors [of the 47 Kenyan counties - M], who are the employing authorities of the nurses as healthcare is now devolved, have said they will not approve any pay increase due to the large sum of money involved. This has only worsened the situation. The nurses union had been engaged in a series of meetings with the council of governors and substantive agreement had been achieved, but the council of governors later disowned this draft CBA [collective bargaining agreement - M] which was agreed upon by the both parties. This comes as the governors undertake a job re-evaluation exercise to determine the roles of the nurses in public hospitals in Kenya. The salaries and remuneration commission had earlier released a grading structure which had placed nurses under 'unskilled/semiskilled workers'. This move has been greatly contested by the nurses who want that particar grading to be scrapped completely. The job-reevaluation exercise by the governors is still ongoing. It has also been established that a nurse in Kenya does almost three times the work being done by nurses in the developed countries. Nurses are also exposed to many life-threatening risks as they come into contact with infectious waste, chemicals and other kinds of dangerous substances at the hospitals. No one has ever bothered to compensate the nurses for this risk. Sh50,000 uniform allowance, paid once annually. libcom: How has the strike been organised? N: Nurses went on strike following delays in implementing an agreement that will give them pay rises. The union had held meetings with the governors and discussed a draft CBA which was agreed upon only to be rejected by the same governors citing lack of funds. The deal was meant to have been signed by the union, the national government and county governments, but the state commission that advises on public sector pay rejected the deal asking the employers to explain whether the demands by the nurses would be attainable. The secretary general of the Kenya National Union of Nurses (KNUN), Mr Seth Panyako, then called for a nationwide nurses strike which affected the public hospitals. The nurses have been in full support of the strike and have been in support of the union. 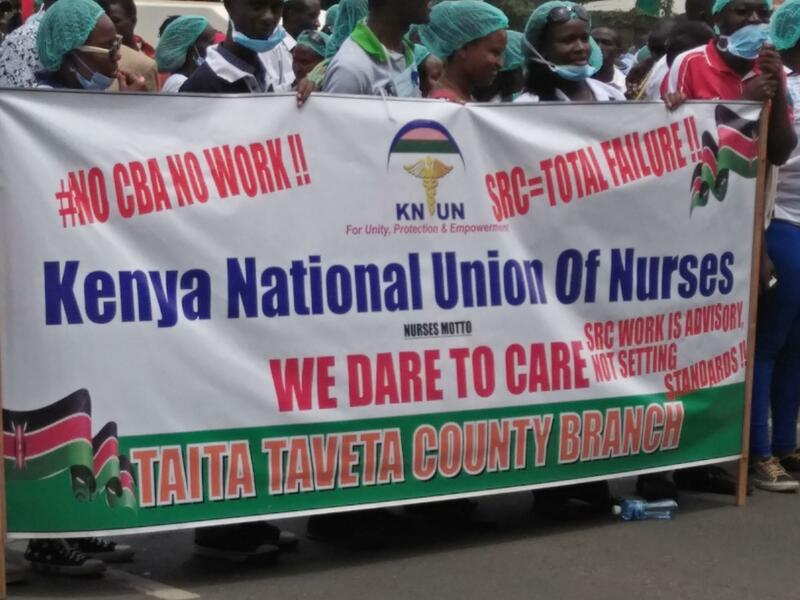 Nurses are holding weekly demonstrations in Nairobi as the employers schedule further meetings to solve the crisis which has now entered its third month. libcom: How effective has the strike been in disrupting hospital services. We've seen street demonstrations in Kenyan media occasionally, are these ongoing? The ongoing nurses strike has affected the public hospitals, services have been ground to a halt and currently no patients can be admitted. This has been worsened by the recent strike involving clinicians. Patients have been forced to seek services in private hospitals which are relatively expensive. libcom: How many nurses are on strike? Are all hospitals in Kenya affected? N: Currently, KNUN has about 26,000 registered members who are participating in the strike. These nurses are spread all over the counties in Kenya. It should be noted that the county governments employ 97% of these nurses. All of the public hospitals in Kenya have been affected by this strike, all the wards have been deserted, hospital doors have also been locked since there are no nurses to offer their services to the patients. The private hospitals have since taken this opportunity to maximize their services; patients from poor backgrounds have been suffering silently, some have been detained at the hospitals for failure to pay bills. libcom: The doctors had a 100 day strike that ended in March, with their CBA signed today, have the doctors been supporting the nurses? N: There has been minimum suport from the doctors or their union towards the nurses strike. The doctors completed their strike which lasted for 100 days and they are a happy lot after the government agreed to sign their CBA. libcom: Clinicians have just joined the strike. Are they in the same union as the nurses? What led to them joining the strike after three months? Clinical officers in Kenya belong to a union known as the Kenya Union of Clinical Officers (KUCO). Their strike is mainly related to the grading structure by the salaries and remuneration commission which has graded them as 'unskilled/semiskilled'. This has been opposed by the clinicians hence they have called for a nationwide strike. libcom: Lecturers also had a two week strike over their CBA in July. Do most of the CBA negotiations with the government require strike action, or has Uhuru Kenyatta and the governers changed their negotiating tactics recently? libcom: We’ve seen several reports of the government threatening to sack nurses and hire strikebreakers from overseas. Has this happened? What has the nurses’ response been? The county governments have kept their threats, they have even gone ahead to advertise the positions for nurses to apply. But the union has maintained their position and dared the governors to sack them. The counties which have advertised these positions include: Kiambu, Kirinyaga, Taita-Taveta among many others. Some counties like Tharaka-Nithi and Nyandarau have, however, decided to engage the nurses in order to end the stalemate. libcom: Has the presidential election affected the dispute? What is the position of Odinga’s opposition party towards the nurses’ strike? N: All the players in the recently-concluded disputed presidential elections have remained relatively silent on this strike, they have only asked the county governments to engage the union in order to end the stalemate. Odinga on his part has not publicly said a word concerning the nurses strike. libcom: How are nurses surviving during the strike action, is there a strike fund? N: This is one of the longest strikes to have ever affected nurses in Kenya. For over three months the striking nurses have gone without salaries. The council of governors gave directives to all the employers to stop salaries of all the nurses, there is no strike fund in Kenya. All of the public hospitals in Kenya have been affected by this strike, all the wards have been deserted, hospital doors have also been locked since there are no nurses to offer their services to the patients.